Lawmakers have introduced H.R. 4158 to "confirm full ownership rights" for certain U.S. astronauts to artifacts from their missions. The dispute over whether NASA's early astronauts have title to the space-flown artifacts they kept as souvenirs from their missions may soon be resolved by Congress. A bill introduced by the chairman and ranking member of the U.S. House of Representatives' Science, Space, and Technology Committee would confirm full ownership rights to the artifacts saved, donated, or sold by astronauts who were part of the Mercury, Gemini and Apollo programs. In a March 2 letter titled "Apollo Astronauts Need Your Help," chairman Ralph Hall (R-Texas) and ranking member Eddie Bernice Johnson (D-Texas) appealed to their fellow committee members to help confer full ownership of these mementos to the astronauts by supporting "this common sense legislation." When introduced in the House on Wednesday (March 7), H.R. 4158 — "To confirm full ownership rights for certain United States astronauts to artifacts from the astronauts' space missions" — had the bipartisan support of 17 other congressmen. "From the beginning of our nation's space program through the Apollo era, NASA astronauts were permitted to retain mementos from their spaceflights," Hall and Johnson said in their joint letter. "Without statutory clarification, some astronauts may be forced to make reparations." The astronauts' rights to expendable equipment, including checklists, personal hygiene kits, and items that if left on board the Apollo lunar module would have been purposely crashed into the moon, were first contended by NASA last year. In July 2011, the government filed a lawsuit against Apollo 14 moonwalker Edgar Mitchell to have the motion picture camera he returned from the moon declared government property. After holding onto the camera for more than 40 years, Mitchell consigned it to a New York auction house to be sold for an estimated $60,000 to $80,000. In court papers, Mitchell argued that NASA had allowed him and his fellow Apollo astronauts to retain equipment as keepsakes if they were not intended to return to Earth. According to the mission plan, had Mitchell not kept the camera, it would have been destroyed with the spent lunar module when it was directed to impact the lunar surface. But those early policies were, for the most part, not written down. It wasn't until decades later that NASA began to set written rules governing the use of space shuttle equipment as mementos. In October, Mitchell settled out of court, surrendering the camerato be donated to the Smithsonian's National Air and Space Museum in Washington, D.C., in return for being responsible only for his own legal fees. NASA's inquiry put a hold on the sale. Lovell, Schweickart and other Apollo astronauts traveled to Washington, D.C. to meet with NASA administrator Charles Bolden to try to resolve what the NASA leader described as "fundamental misunderstandings and unclear policies" regarding space artifacts from the Mercury, Gemini and Apollo programs. "We'll explore all policy, legislative, and other legal means to resolve these questions expeditiously," Bolden said. "The agency will support whatever legislation comes from Congress," said NASA spokesman Bob Jacobs on Friday (March 9), reacting to the introduction of the House bill. "This is in line with the discussion that the astronauts had with the administrator back in January." The bill applies only to artifacts held by U.S. astronauts "who participated in any of the Mercury, Gemini, or Apollo programs through the completion of the Apollo-Soyuz Test Project" in 1975. An artifact is defined as "any expendable item... not expressly required to be returned to [NASA] at the completion of the mission and other expendable, disposable, or personal-use items." 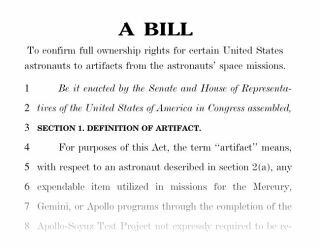 The bill, if it is passed, would extend to more than just the artifacts currently in the astronauts possession.